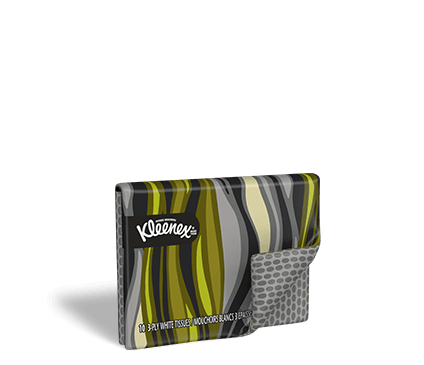 Kleenex® trusted care* on-the-go* slim pack is rated 4.9 out of 5 by 562. Rated 5 out of 5 by Ronda from Perfect Size I work in Home Health. The slim packs fit right into the cargo pocket of my scrub pants! So handy to keep right with me from patient home to patient home! Rated 5 out of 5 by Nenna 66 from I LOVE these slim packs. I love these slim packs! They are just the right size for a pocket or purse. I love the fold-over design. I am an allergy sufferer and I save an empty pocket pack to dispose of my used tissue. No more spreading germs in my purse or forgetting a used one in my pocket! The designs are adorable too! Thank you. Rated 1 out of 5 by Frustrated from We used to provide these for families during funerals. Now with the "cutesy" slogans, they are completely inappropriate and the other Kleenex pocket packs are too rough and/or doesn't fit our needs. Will be purchasing another brand from here on out. Rated 5 out of 5 by lmarywill from Just the right size I've used your travel size Kleenex tissues forever. You've changed the packaging and the new packaging gets an A+++++/ The size is flatter and more attractive and it is easier to pull out a tissue or store it in my purse. Nice job!